by Jeevan Sivasubramaniam, Managing Director, Editorial, Berrett-Koehler Publishers Inc.
Craig and Patricia Neal have been organizing gatherings and meetings for decades across the nation and have a pretty solid idea of what works and what doesn't. However, even seasoned conveners still make mistakes when bringing people together or forget what really matters. 1. Not "Staying Connected": Convening is about being open to relationship rather than closed. It is a challenge to choose to stay connected and open when our lives and schedules are full and our time is precious. Stay connected by knowing who you are and how you want to be in relationship with others. You always have a choice when you walk into a meeting: do you want to be connected, or stay closed? Choosing connection can lead to collaboration, creativity, purposeful outcomes. 2. Fearing Rejection: The fear of rejection can derail our ability to extend a wholehearted and sincere invitation. Invite often - for all kinds of things - and experience acceptance and rejection as others’ freedom to choose rather than a personal success or failure. We often think that colleagues are too busy to talk beyond the cursory business at hand, but when we persevere, people are grateful for the opportunity to catch up and reconnect. Our fear of rejection, rather than rejection itself, was holding us back. 3. Making Assumptions: We say “assume and doom.” When we assume others know what a gathering’s all about, we put our gathering squarely in the realm of the unknown. Make the purpose and desired activity for a gathering as clear and explicit as possible - even if it seems unnecessary. At one important meeting, knowing we had only an hour, we jumped right into the action items. We neglected to set the context, assuming we were all on the same page. At the end of the meeting, people had different understandings of the purpose of the meeting and were not aligned in a commitment to action. 4. Reluctance to Impose Our Will on Others: “You’re not the boss of me!” How often have we said or heard words like that? But providing structure, environment and terms of engagement is a crucial part of convening. People need structure. If there is no structure, people look to create it. At a recent family gathering, we felt we should not be too controlling, but this led to a lack of clarity in stating the terms of engagement or agreements for a discussion. Everyone jumped in, in their own way, with cross-chatter and began talking over one another. It would have been better to state our expectations ahead of time to enable all people to be heard. 5. Impatience and Judgment: The compelling desire to “Just get on with it!” can rush us obliviously past the most important pieces of wisdom and capability present in our gathering. Remember, anyone included is equally important and essential. At the beginning of most meetings we do a check-in to hear from everyone. This one time we were 15 minutes late. we suggested we skip the check-in and move right into the agenda. Halfway through the meeting we realized we didn’t have everyone’s attention and didn’t have the necessary alignment to make important decisions we were there to make. There are actually four other scenarios that generate obstacles for effective convening but we chose the five most common. What do you think? Did we choose the five most common? Do you have any feedback or ideas for us? Stay tuned for the next article on 5 Things that Work and Matter. This book, rooted in decades of practical experience, details a powerful set of principles and practices for making any gathering productive, meaningful, and transformative. "Meetings are a waste of time," is a sentiment many of us share, which is tragic, because meetings bring us together as human beings. To achieve the kind of meaning or breakthrough results most of us really yearn for when we gather, the key quality needed is authentic engagement: a genuine expression of what is true for us, and an attentive listening to what is true for others. Why it so often eludes us can be a matter of habit, distrust, lack of attention, or fear. As co-founder of Heartland Inc., Craig and Patricia Neal have led over 220 of their acclaimed Thought Leader Gatherings with leaders from over 1500 diverse organizations. Their new book shares for the first time the unique and powerful Art of Convening model -- developed in these gatherings and refined over thirteen years of intensive trainings -- that brings authentic engagement and meaning to any group brought together for any purpose. Convening goes beyond facilitating. Convening creates an environment in which all voices are heard, profound exchanges take place, and transformative action results. 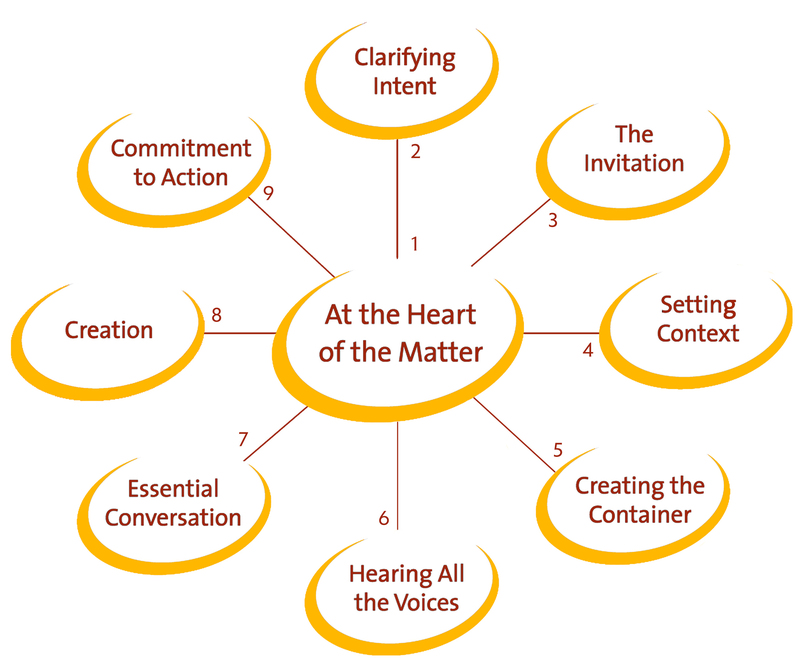 The heart of this book is the Convening Wheel -- a series of nine steps, or Aspects, that bring the practices and principles needed for authentic engagement together as a whole. The book provides exercises, stories, and questions to help you master both the inner and outer dimensions of this work -- because, in convening, the state of the Convener is equally as important as the physical preparations. Convening works in any setting and can be adapted to virtually any group process. With this book you have all the tools you need to develop this essential life and leadership skill, one that will lead to improved outcomes in your organization, community, family, and relationships. CPL Team Reception with Richard Leider! This past Wednesday, Center for Purposeful Leadership hosted its' first reception welcoming over 45 colleagues. Our purpose was not only to convene and reconnect with colleagues but to introduce the CPL Team. We were honored to have purpose leader Richard Leider speak on the Purpose Movement and Purpose Research. Scroll down for a livestream of remarks from CPL, The Waters leadership, and Richard Leider. We were so pleased to connect and convene with others to spread the voice of what Center for Purposeful Leadership stands for. The Waters leadership embodies purposeful leadership. Thank you to Kyle Didier, Lynn Carlson Schell, Katherine Todd and The Waters for hosting, and to those who attended. Gathering with so many thought leaders from the Twin Cities truly shows the great direction purposeful leadership is headed. CPL is honored and excited to have you on this journey with us!